← Going the Extra Mile. A few weeks ago I was walking along the banks of the River Spey when I heard a cuckoo call. Unusually it was not in the distance but close by. I waited for it to call again. The next time I heard it the direction had changed. It appeared to be coming from the other side of the river. I noticed a bird of the right size sitting on power lines. I readied myself to take a photograph using manual focus. 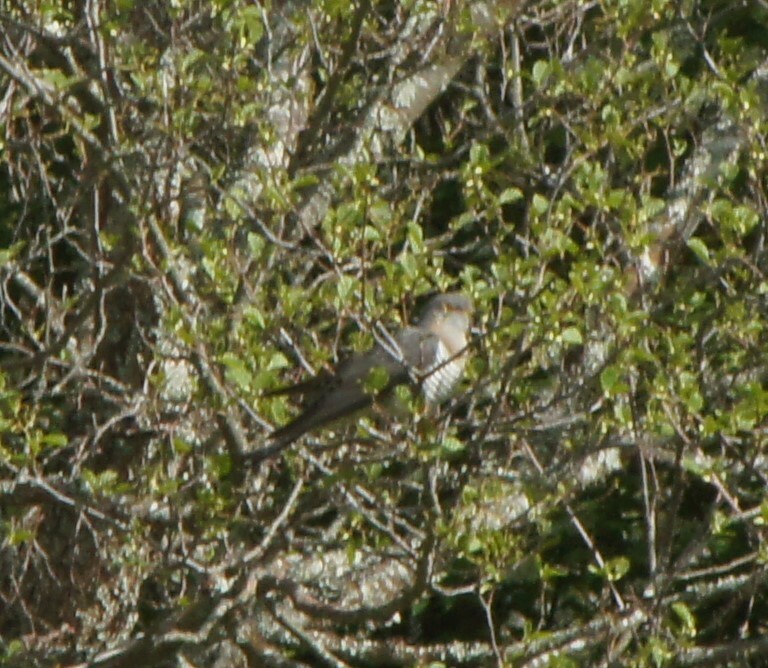 This was the first time I had actually seen a cuckoo in my life, having only heard one in the distance. I managed to get one picture before it flew off but it was slightly out of focus. I walked further along the river and continued to hear the cuckoo. On occasions I glimpsed a bird flying around and it made a cuckoo sound as it flew. It was too far away to photograph but I began to get my eye in and observe its behaviour. Sometimes it would sit in dead trees because it could see potential food from afar. But it rarely stayed in the same tree long enough for me to get anywhere close enough to get a decent shot. Much of the time it was in silhouette so there was little indication of its plumage. The one shot I did get that showed off its plumage to best effect was marred by the fact that it was partially obscured by foliage and the focus was slightly out. But as cuckoos are apparently becoming rarer and it was the first time I had actually seen one I was quite pleased with myself. The next day I opened my newspaper, the [Glasgow] Herald, and there was a reader’s picture of a cuckoo which was superb that put all my efforts to shame. My reaction was mixed. I appreciated the effort and patience required to accomplish such a result. But I also thought of the ‘if only’s, the potential shots I failed to make. I have to admit that part me resented the photographer’s good fortune in taking such a good picture. I was reminded of the phrase from the Bible about our righteousness being as filthy rags. When I looked it up in a concordance I was surprised that it was from Isaiah Chapter 64 verse 6 rather than one of Paul’s letters. Though I think he was alluding to this in Ephesians Chapter 4 verses 22-4 where we are taught to put off your old self and to put on the new. We like to think that our efforts of our own flesh will be good enough. It is only when we compare that God’s perfection that we realise how far short we actually are. Unfortunately, we tend to hang on to our old familiar rags because we feel comfortable in them. Even if they are not to be used for best occasions we want to keep them for paint jobs and such like. It so happened that today (though I started this post it a couple of days ago) I received new trousers for my uniform at work. After I finished my shift I took off the old ones, complete with a large hole in one of the knees, and threw the old ones in the recycling bin. So quite literally I put off the old and put on the new. This entry was posted in reflections and tagged Christianity, cuckoo. Bookmark the permalink.